Cyber Monday and Black Friday are over, but the bargains keep rolling in. Online retailers are rolling out full Cyber Week discount plans and we've scoured the web to find the best deals for your gaming and gaming-adjacent needs. Take a look at the selection. Today's deal of the day is the Microsoft Store's bargain on Xbox One S 500 GB Battlefield 1 bundles, including an extra free game. Pick up the slim console and your bonus game and EA Access subscription for $299.99. View deal: Xbox One S Battlefield 1 Bundle with a month of EA Access and choose-your-own free game from Microsoft Store. We have even more deals, including a nice little selection of 4K Tvs to plug your new console into. 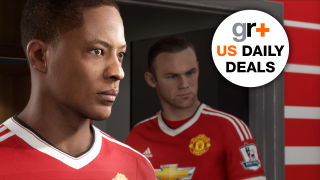 Check out the best US game deals below, and come back tomorrow for more PS4, Xbox One, and hardware bargains. Xbox One S 500GB: Xbox One S Battlefield 1 Bundle with a month of EA Access and choose-your-own free game from Microsoft Store. Don't worry, you haven't missed out on all the great Xbox One S bundle deals. Pick this one up and you can get started with a new console (in white or storm grey), Battlefield 1, and another free game from Microsoft's selection. Don't underestimate the value of that month-long EA Access membership, either - the Vault is full of cool games, all for free. View this deal: Xbox One S Battlefield 1 Bundle with a month of EA Access and choose-your-own free game from Microsoft Store. Titanfall 2 (PS4 and Xbox One): Go fight in a mech for $39.99 at Walmart on PS4 and Xbox One. FIFA 17 (PS4 and Xbox One): Have a (soccer) ball for $39.99 at Walmart on PS4 and Xbox One. Call of Duty: Infinite Warfare (PS4 and Xbox One): Go fight in space for $39.82 at Walmart on PS4 and Xbox One. Xbox One with extra controller for $30 off: Save on this console/controller bundle for $30 off at Best Buy. Sony 4K HDR TV: Sony's 55" XBR55X850D will work great with your PS4 Pro and Xbox One S, and you can pick it up for $898 at Amazon. Sony 4K OLED HDR TV: Upgrade to an OLED screen for more vibrant colors, now $1,997 at Amazon. Samsung 4K HDR TV: This 60" set from Samsung is down to $1,199.99 at Best Buy. Xbox One Elite Controller: Save $10 on this super-customizable controller, now $139.99 at Microsoft Store. Logitech G29 Racing Wheel: Race with the best of them for $100 off, now $299.99 at Best Buy for PS4 and Xbox One.